On nearly any given evening, the drive on Highway 30 from Portland to Scappoose is easy and fine. It travels like a Sunday driving road: First, the rail yard and its colored cars fly by, then the gothic St. Johns Bridge appears, and finally a verdant Oregon jungle emerges that belies its close proximity to a big city. Scappoose, a mere half hour from downtown Portland, is home to Rosebud Cafe. The restaurant, bar, and music venue is gaining popularity from local bands and fans who appreciate the commitment its owner, Don Zerr, has made to offering live music three nights a week. Indeed, his background and experience in music production (he mixed live bands for KBOO for many years) and as a working musician (he has performed in local and Montana-based bands for over twenty years) lend him some definitive expertise. So, your building was formerly The Wayside Tavern, not known for its live music. What got you interested? I lived in Montana for fifteen years prior to buying. I moved back to the Portland area and was trying to buy a house. The tavern came with a house, so I figured what the heck? What could go wrong? I love the backlit roadside marquee outside; there are shades of Route 66 in the facade. The same goes for the interior. There’s something really “throwback” about the vibe — the pool tables, the decor — how’d you choose the name? I’ve always loved “Rosebud Cafe” and almost opened a tavern in Montana and called it that. It brings in the famous roses of the Pacific Northwest, and of course, the rose meme from the hippies and the Grateful Dead . . .
Wasn’t Jerry’s guitar named Rosebud? Just a coincidence with Jerry’s guitar. I don’t need the band suing me for trademark infringement! There’s a nice range of musical genres represented by the bands who play Rosebud. I do notice there’s a fundamental circling-back to the blues. Yeah, it seems nowadays that styles of music have melded together where a band may play a blues number followed by a folk song. The lines between genres have really merged together lately. 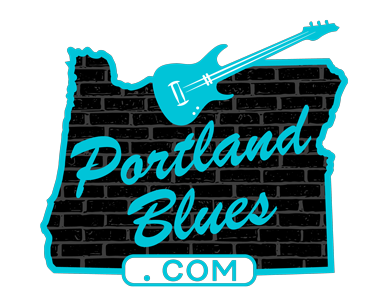 That said, I went to college in Eugene and spent many a night at Taylor’s Bar & Grill listening to blues bands like Terry Robb and Big Monti Amundson. I finished college at PSU, which at that time saw The Candlelight Room hosting seven nights of blues a week. Rosebud has hosted Tracey Fordice Band, Kode Blues Band, and Billy Hagen, among other strictly blues bands, plus a lot of others who cross over into blues. I’m open to booking more. Well, it’s actually not that easy to fill a room that will in turn pay for live music. Sometimes people don’t understand that. There’s a ton of great musicians playing here in the Northwest, but consistently drawing in a good crowd can be very tough. Of course, it helps when bands promote themselves. Bands that book a gig and then don’t promote it might be my greatest frustration in offering so many nights of live music. I definitely lose money some nights, but I’m trying to build something here that I know will take some time, so I’m willing to take a loss for a while. I also knew I’d be giving up every single weekend night, so I book many of the bands that I’d go see if I had the night off! I get so many requests from great bands who want to play, and there aren’t enough dates in the year to support all of them. I feel bad about that, but hope to get them worked in as time progresses. Hopefully you’re getting to play some yourself. You ever sit in on sets? I do sit in with bands on rare occasions, and my own band plays a couple of times a month so I can get some stage time. It’s in my heart. The Rosebud Cafe is located at 50316 Columbia River Highway in Scappoose. They offer a full bar, lunch and dinner menus, and breakfast at 11:00 am on weekends. Live music Thurs. 6:30-8:30, Fri-Sat 8:30-midnight. Find them on Facebook or at www.therosebudcafe.com .